Safety labels in the workplace play a crucial role in preventing bodily injury, equipment damage, and litigation cases. Here, we outline where and how you should display safety labels in your workplace. These labels may appear around your workplace to remind employees about basic safety measures, such as wearing proper footwear or keeping a door closed. 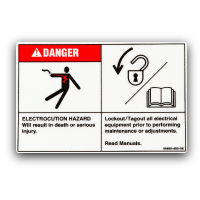 ANSI specifications are flexible for these types of labels, but generally they should include a pictogram and the signal word NOTICE, along with a brief description of the required action. These labels should be blue in color. These labels are very important in keeping your workplace up to code and in times of emergency. Fire equipment labels should be red and should identify the equipment in large block letters (i.e. FIRE EXTINGUISHER). They can also include a pictogram and a brief description of how to use the equipment. Mark any fire safety exits with red labels as well. Exit labels should simply say EXIT and should be placed above doorways and entryways that provide an exit route. They should appear in green or, most ideally, be illuminated by a green backlight. At US Nameplate Co. we want keep your workplace safe with effective, up-to-code safety labels. If you have any questions don’t hesitate to contact us, and be sure to watch for our next post, where we will guide you step-by-step through designing a custom safety label. Well, this is my first take a look at to your blog! We are a group of volunteers and starting a brand new initiative in a regional community in the exact same niche. Your blog provided us valuable information to work on. You have done a marvellous job! Thanks for providing this kind of a great report, it was outstanding and extremely informative. as a first time customer to your website I am extremely impressed. I discovered a good deal of insightful information in your report. Keep it up. Thank you. Wow, marvelous weblog structure! How lengthy have you been running a blog for? you made blogging glance easy. The whole glance of your site is great, let alone the content material! Hi there,I read your blogs named “Safety Labels in the Workplace – U.S. Nameplate Co. Blog” on a regular basis. Your doing what you’re doing! I simply want to say I’m beginner to blogging and site-building and absolutely enjoyed your website. Very likely I’m want to bookmark your site . You amazingly have incredible articles. Thank you for sharing your web site. I simply want to say I am just beginner to blogging and site-building and seriously enjoyed your blog. Likely I’m planning to bookmark your blog post . You really come with fabulous well written articles. Appreciate it for sharing your web page. came to “return the favor”.I’m attempting to find things to improve my website!I suppose its ok to use a few of your ideas!! First-class writing! Yet I’m more interested in the resplendent theme you’re using, mind sharing it’s name?